The first story-based downloadable content for Dishonored will focus on supernatural assassin Daud. If you've already completed your adventure in Dunwall, fear not: more content for Dishonored is on the way. Bethesda has announced that Dunwall City Trials, a collection of ten challenge maps, will be available in December for $4.99. The maps "will test and track your combat, stealth and mobility skills," with challenges like fighting waves of enemies in a battle arena, having to perform a series of drop assassinations, and racing against the clock to complete your objectives. 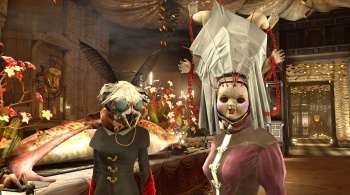 Two more DLC packs are coming to Dishonored in 2013, and both of them will be story-based. The second pack will focus on Daud, the leader of The Whalers, a group of supernatural assassins. Playing as Daud will allow you to "make your way through new Dunwall locales and discover Daud's own set of weapons, powers and gadgets." Like in the main game, the choices you make as Daud will affect the outcome of his story. It will be out early next spring. No details were given for the third set of downloadable content, with Bethesda promising more information next year. Prices for the DLC story missions will be revealed closer to launch.